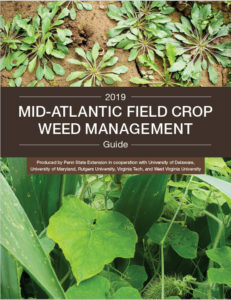 The 2019 updated version of the “Mid-Atlantic Field Crop Weed Management Guide” is available. This guide is collaboratively developed by weed scientists from Penn State, , Univ. of Delaware, Univ. of Maryland, Rutgers University, Virginia Tech, and West Virginia Univ. The guide covers weed management for field corn, sorghum, soybean, small grains, and forage and pastures. Information concerning the use, restrictions, and recommendations of burndown, preemergence, and postemergence herbicides labeled on these crops can be found in the guide, including relative effectiveness data from locally conducted research. Description of the various premixes as well as guidance for managing troublesome weeds are also part of the guide. The guide can be ordered on-line at https://extension.psu.edu/mid-atlantic-field-crop-weed-management-guide. Available on-line are the printed copies for $25; an enhanced pdf copy for use on computers and tablets for $15 or both a hard copy and pdf for $35. The 24(c) Special Local Need Label for Stinger® that had expired on December 31, 2017 has finally been renewed up to December 31, 2020. 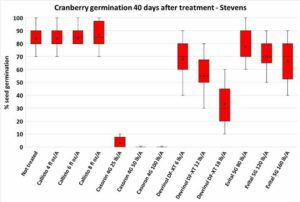 Stinger® is especially useful in blueberry for controlling composite and legume weeds. 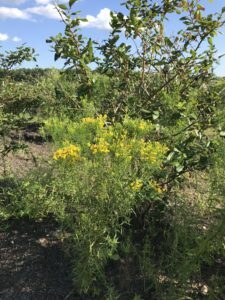 Common composite weeds found in our orchards include Canada thistle and other thistles, goldenrod species, aster species, common dandelion, mugwort (wild chrysanthemum), horseweed (marestail), and ragweed species. Legume weeds include vetch species and clover species. The application of Stinger® should be timed to match the emergence of the perennial weeds in the spring when the carbohydrate food reserves in the plant are at the lowest point. Treatment at this time reduces the weed’s chance of recovery and survival. Optimum results controlling deep rooted and hard to control perennial weeds, including Canada thistle, perennial asters, goldenrod species, and mugwort (wild chrysanthemum) will be obtained if the Stinger®® application is split. First application: apply Stinger® at the rate of 1/3 pint/acre after blueberry bloom, in late April when the weed is emerging. Some weeds can “survive” for months on established existing foliage even though Stinger® suppresses all new growth. Tank-mix with Gramoxone to increase the spectrum of weeds controlled and kill existing foliage of perennial asters, goldenrod species and mugwort. Second application: Apply another one third pint of Stinger® immediately after harvest in mid-summer. Spray the second application even though no growth of the target weed is evident. The second application is essential for the elimination of the hard to kill established perennial weeds. If the second application is skipped, expect to see the weed re-emerge in late August or September. Stinger® is both preemergence residual herbicide and a postemergence foliar absorbed herbicide. The initial twisting and curling observed after application to susceptible species is due to the foliar absorption. Control of established perennials is due to residual activity of Stinger® in the soil which prevents regrowth from the roots. In certain species, such as mugwort, Stinger® prevents regrowth but does not kill the mature leaves. The plant will survive unless another herbicide, such as Gramoxone® SL 2.0 or Rely® 280, is used to defoliate the plant. Do NOT apply Stinger® in a hand held sprayer used to “spray until wet”. Stinger® is a residual herbicide that must be applied on a rate per acre basis. When treating “patches” of perennial weeds, apply the recommended rate per acre with a calibrated sprayer. Treat ten to fifteen feet beyond the weed “patch” on all sides. Spray the sod or row middles adjacent to the weed “patch” in the row. Late summer and fall are perfect times to work on tough-to-control perennial weeds such as Virginia creeper vine, bindweed, green-brier, Canada thistle, goldenrod, and poison ivy. These perennials are among the most difficult weeds to eradicate, especially because of their ability to generate new shoots from their root systems. Successful management strategies will mostly rely on herbicide that can move from the leaf to the below-ground plant parts. Timely initial application and consistency at controlling any regrowth with follow-up spot treatments are crucial for long-term control of these weeds. Glyphosate (Roundup or other generic products) is the only postemergence herbicide labeled on blueberry that can provide good control of perennial weeds. Late summer and fall are good times for applying glyphosate as plant sap movement is mostly directed toward the roots where nutrients will be stored in anticipation of next season. Therefore, large volume of glyphosate can easily be translocated from the leaves to the roots, improving the efficiency of the herbicide at killing below-ground storage organs. It is VERY IMPORTANT for glyphosate to be applied when weed leaves are still green before fall colors appear. Use extreme care not to contact crop green tissues (stems and leaves) with glyphosate. Glyphosate absorbed by crop green leaves and bark moves within the plant and can severely damage or kill above-ground and below-ground parts of annual crop and perennial treess. Weeds such as bindweed, Virginia creeper, and greenbrier may need to be pulled out of the trees so they can be treated safely. This may seem too slow to be practical, but consider what these weeds cost in lost income. For example, blueberry bushes covered by Virginia creeper vine may yield just 20% of their potential. This easily equates to a $5 to $10 loss per bush. The loss is incurred each year and increases as the vines spread to neighboring bushes. Investing 15 minutes to carefully pull vines out of that bush and safely treat them on the ground is money well spent. Glyphosate should be applied through low pressure spot treatment to limit drift movements. Glyphosate absorption will be improved if ammonium sulfate (17 lbs / 100 gal water) is added to your spray mixture. For effective control, at least 50% of the foliage should be wet with glyphosate applied as a 2% solution (see your product’s label for rate necessary to reach this concentration). Consider also “cut stump” applications for Virginia creeper or poison ivy that have large diameter stems. Apply a 2% glyphosate solution to the cambium (inner bark area) IMMEDIATELY after cutting the stem. Don’t let time for cutting to dry as this would prevent glyphosate absorption and translocation to below-ground plant parts. Always apply glyphosate on weeds that are actively growing and not under drought stress. Always refer to the commercial product label for rates and additional information.